Two years and two weeks ago, on a crisp fall day at Wall Street in New York, we launched N1QL in Couchbase 4.0. Even before the launch, we had customers using pre-release N1QL because it solved the critical business problem: manipulate the JSON data as a set, just like SQL. In the two years since, the customers, community and the product have grown rapidly. We have hundreds of customers using it in production. Customers have continued to innovate building modern scalable applications for CRM, user profile, entitlement, inventory, gaming and more. Community participation and interaction on the Couchbase N1QL forum have increased in quality, quantity, and complexity. We love all the interactions and tough questions. Customers and customer jobs inspire us to innovate and do more. Since the initial release, we’ve learned from use cases and enhanced query & indexing language, performance, and capabilities in all of the releases. Novel indexing technology based on lock-free skip list has improved the performance by orders of magnitude. Generalized array indexing is the best in the industry. Pagination query performance has given customers both agility and scale. We’re delighted to release the second edition of the N1QL book with updates to query optimization, monitoring, profiling, security, and tooling to reflect the features in 5.0. 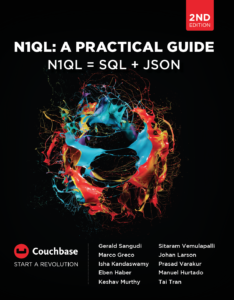 A Guide to N1QL features in Couchbase 5.5, Special Edition is now available!